So when I read over the recipe for these Hepburn brownies, I did a happy dance and knew exactly how I was going to change ’em up. Since I’ve kicked the good stuff (read: caffeine), I decided to go all out with a little jolt… dark chocolate cocoa powder, chopped dark chocolate and espresso powder. Talk about caffeine overload. YUM!! A big caffeine-induced “thank you” to Lisa of Surviving Oz (the creator of our fab new logo!) for this week’s pick! I love coffee too, impossible to live without! Wonderful brownies! Yeah, I gave up drinking coffee this summer and it was not easy, but these brownies look like they brought back a good jolt! They look fantastic! Caffeine triggers my migraines, too, so I make my own brew at home…75% Peet’s decaf French Roast and 25% Peet’s French Roast. I get a tiny bit of caffeine without living in a dark room three days a month. I’m glad you made these with the espresso powder and enjoyed them! Decaf isn’t so bad, though – at least you still get your ‘bucks everyday! 😉 Great looking brownies, J! I love your brownies. They look so dark and delicious. YUM. I remembered my caffeine college addiction. Good times, right? Most of my friends are STILL Starbucks junkies, despite the recession! I figured there would be brownie baking going on over here this week. Yep, just knew it. Those are really really rich and chocolatey! Coffee and Chocolate-love the combination. Your brownies look super gooey good. I love the dark cocoa powder. These look great! Holy Moly! 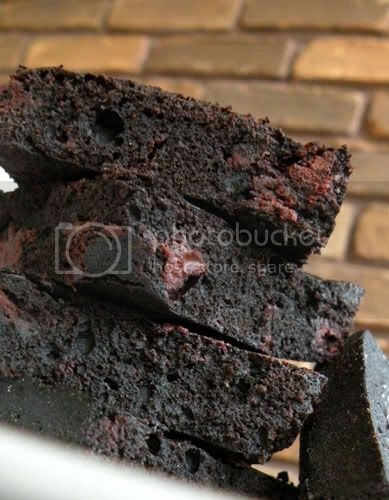 Those are some seriously dark brownies! Wow, you’re brownies look delish! Much thicker than mine were. These look fantastic. I want one. Wow! These are truly intensely dark brownies! I bet they gave you a jolt! They sure are dark! They look fantastic though. Your brownies look perfect! Glad you enjoyed them! I hear you on the coffee shop addiction. I go to this local place called Mocha Madness and let me tell you it’s my MAD addiction. I drink chai tea and like you every day it’s ready for me when I walk in the door!! 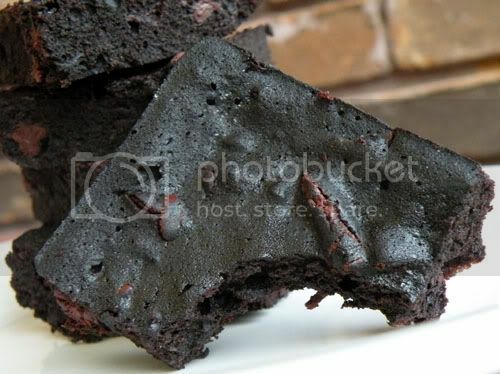 Your brownies look so good and dark! Of all of the brownies I’ve been seeing, I haven’t seen any quite as dark or tempting!! Fantastic. yum! Great looking brownies! My mom would be all over those (she’s a dark chocolate junkie)! I also gave up coffee, almost a year ago. But no decaf, it’s too near the real thing. But I still cook with it. It really enhances the chocolate. Glad you enjoyed! Love you story and glad you don’t let a little fun get you down. Living on the edge can be a little funsy too. Take care of the noggin though. Great brownies aren’t they? WOW!!! 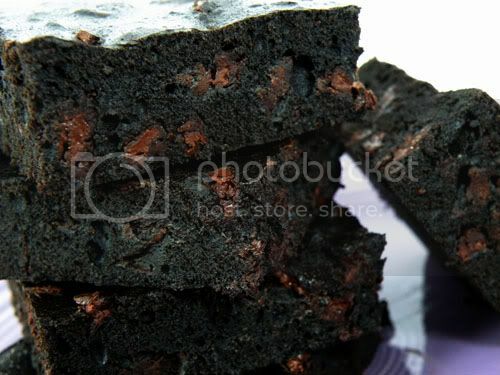 Look at those deep dark,dense brownies. Fantastic. Those brownies look like they deliver quite the jolt of chocolate-y deliciousness! I hope they didn’t induce a migraine. My migraines have no (known) trigger, so I haven’t had to make food sacrifices.